Ankylosaurus lived between about 74 and 65 million years ago (possibly 68 to 66 million years ago) towards the end of what scientists call the Cretaceous Period. Scientists subdivide geological Periods into stages, and the stage of Late Cretaceous Period in which Ankylosaurus lived is known as the Maastrichtian stage. The world at this time was very different from that of today - it was warmer than today's world (although cooler than the preceding Triassic Period and Jurassic Period in which dinosaurs had also dominated the Earth. Over long periods of time the Earth's continents move around througn a process known as "continental drift". 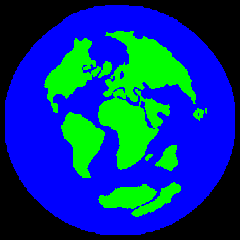 During the Late Cretaceous the continents' positions had begun to resemble their modern configuration, but because the world was warmer, sea-levels were much higher than today. 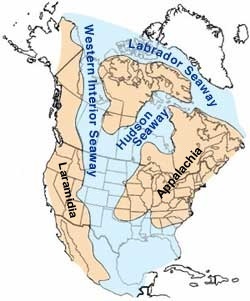 Consequently, central North America was in fact submerged beneath a shallow sea, and the western and eastern halves of the North American continent were separated by the a shallow sea, known by scientists as the "Western Interior Seaway". Based on the locations where its fossils have been found, Ankylosaurus is believed to inhabited the uplands near the western shore of the Western Interior Seaway (scientists call this region "Laramidia"). A close relative of Ankylosaurus, Edmontonia, is believed to have inhabited the nearby lowlands. At this time, the region would have been a broad coastal plain, a floodplain environment, and would have extended Westwards to the then newly formed Rocky Mountains. The climate would have been subtropical, and generally warm and humid. Plants would have been mainly angiosperms (flowering plants), but also conifers, cycads, and ferns - and would have been forested by small trees. Other herbivorous dinosaurs that would have been present in the environment include Edmontosaurus, Pachycephalosaurus, Torosaurus, and Triceratops, as well as Edmontonia. Carnivorous dinosaurs living in the area included Struthiomimus (most likely a carnivore, but this is not certain), Ornithomimus, Troodon, and Tyrannosaurus.